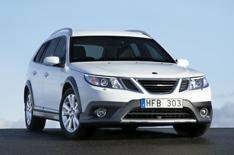 Revealed: Saab 9-3X | What Car? This is the Saab 9-3X, a new high-riding estate. It is powered by a turbocharged 207bhp 2.0-litre petrol engine mated to a four-wheel-drive system, or a 177bhp 1.9-litre diesel engine linked to front-wheel drive. The 2.0-litre unit produces 221lbft of pulling power, and can accelerate the 9-3X from 0-60mph in 8.2secs. A six-speed manual gearbox is fitted as standard, with an automatic gearbox available as an option. Linked to the manual, the 9-3X will return 34mpg and emit 199g/km of CO2. With the automatic it will return 28mpg and emit 242g/km of CO2. The diesel engine produces 295lbft of pulling power. It is also available with a manual gearbox as standard, and an optional automatic gearbox. With the manual it returns 51.4mpg and emits 144g/km of CO2, while with the automatic it returns 40.9mpg and emits 182g/km of CO2. To boost ground clearance, the chassis is 35mm higher on the four-wheel drive version of the car, and 20mm higher on the front-wheel drive car. Emphasising the car's rugged appeal, the bumpers, side sills and wheelarches are finished in a dark grey protective covering. 'The 9-3X is an efficient all-rounder for anyone who doesn't want or need an SUV-type vehicle,' says Simon Padian, Saab Brand Design Chief. Inside, the 9-3X has 419 litres of boot space with the rear seats up, and 1287 litres with the boot down. The rear seats fold 60:40 and incorporate a ski hatch that folds down. The 9-3X has a revised trim from the standard 9-3, including dark metallic detailing and sports seats. Prices will be released around May, but they're expected to begin at around 30,000.